They are from Israel and musically represent the Balkan tradition, but Balkan Beat Box, a genre-defying band encompassing reggae, electronica and Mediterranean music, would love to work with legendary Indian singer Asha Bhosle. "I would love to work with Asha Bhosle. I like her music and have quite a few of her CDs," Ori Kaplan, the saxophonist and co-founder of Balkan Beat Box, told IANS on the sidelines of the ninth edition of the SulaFest here. Kaplan also confessed his love for Bollywood and Hindustani classical musician Ali Akbar Khan. "I like Ali Akbar Khan and Bollywood a lot along with Pakistani legend Nusrat Fateh Ali Khan," he added. Formed in 2003, the band has established itself in the world music scene with its diverse sounds that blend different themes together. But contrary to their name, Balkan Beat Box is not a beatboxing band. "It is not beatboxing at all. It's a terrible name, but we got stuck with it. It represents the main elements, the beatboxing kind of electronica. And Balkan represents the tradition," Tomer Yosef, the band's lead vocalist, said. 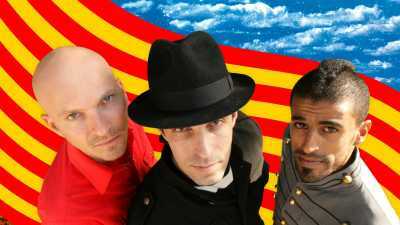 Yosef described Balkan Beat Box's music as "spirit lifting". "It is happy and lively. A clash, mesh-up of cultures. We draw infuences from Mediterranean, European, reggae, Arabic music etc," Yosef said. The band, who performed their first concert in India at Day One of the SulaFest here, are amazed with the country. "We arrived here, took rest and went to soundcheck. We didn't get the chance, but we are here for three days so we will explore more. It is our first time in India, so everything is amazing," Yosef added. Day Two of the 2016 edition of SulaFest will conclude on Sunday.